In 1992 my wife Michelle and I met in high school in Southern California. We fell in love and also realized at an early age that we wanted to pursue similar passions. Around the same time my God-Parents Chrissy O’Grady and Joe Martin started “The Reptile Family” in Southern California’s Venice Beach. Since then they have grown both in family and experience, as well as Michelle and I have. Their programs now reach throughout Southern California. They inspired and encouraged Michelle and I and supported the endeavors that we were setting out to achieve. 2001 changed my life as I started attending Moorpark College’s Exotic Animal Training and Management Program. I graduated in 2003 with certifications in Wildlife Education, Exotic Animal Training and Management, and Zoology. I have worked with numerous species of exotic animals including big cats, primates, hoof-stock, like camels and water buffalo, birds of prey, parrots, and our course reptiles. While living in Southern California I continued to do outreach & education with The Reptile Family, as well as got involved in the movie and television industry. I have been fortunate enough to work with people like Steve Irwin, Jeff Corwin, Jules Sylvester, and Dr. Brady Barr. I have worked on numerous music videos, late night talk shows, and movies including Starsky and Hutch, Lemony Snicket, and Dawn of the Dead. 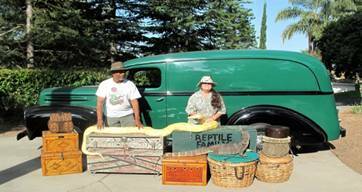 In 2005 my wife Michelle and I moved to the Central Valley here in California and opened up E&M’s Reptile Family, LLC. We now enjoy bringing our family of bugs, frogs, lizards, turtles, tortoises, and snakes to all of Central California. We travel throughout Kern County, Tulare and Kings County, Fresno County, Madera County, and everywhere in between and around! We love inspiring young folks, as well as adults. Sharing our passion for animals and life is a true reward. We replace fallacies with fact and nurture conservation with education. Our hands-on approach is truly unique and will make an impression that lasts a life time through. Most of our animal family is rescued from homes and environments where their owner’s did not do any research before purchasing them. It is sad that so many animals need homes, and it is not just reptiles. There are many animals every day that get neglected, abused, or simply turned out. We hope through our presentations that we can help, and educate, the public to make better choices when it comes to getting a pet of any kind. We do not believe in taking animals out of the wild to use in our show, or to have as part of our family. Wild animals are just that, wild. They should be left to live their life free and of course looking is always okay! Through our programs we stress this point and hope that our future generations will continue to care and protect wild animals and their habitats. Please feel free to contact us anytime regarding your reptile pet, or an animal you are thinking about getting as a pet. We hope you enjoyed learning a little more about us and we look forward to visiting your school, library, community, or home very soon! If you would like to visit our God-Parents website to learn more about their shows in Southern California check it out and www.reptilefamily.com.